The aftershocks of earthquakes can occur decades, and even centuries, after the initial tremors, according to new research carried out by scientists at the University of Missouri. Does this mean that the 1906 earthquake could still destroy San Francisco? The study, reported in the journal Nature, found that aftershocks near to tectonic boundaries continue for only a few years but further away they can occur over a timescale of decades and centuries. Recent earthquakes in Canada's Saint Lawrence valley, for instance, may be the aftershocks of an earthquake that occurred in 1663. Similarly, a magnitude 7 earthquake that occurred near a town called New Madrid in Mississippi in 1811 is still causing aftershocks that can be felt in the American mid-west because these shocks are the result of movements that are 100 times slower than the movements that occur near to a tectonic fault line. 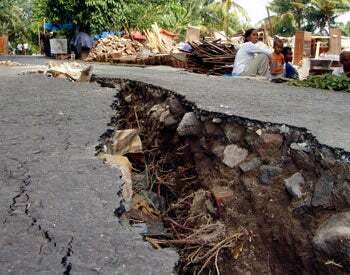 Scientists hope to use this discovery to work out where future earthquakes may occur. Evil scientists hope to use this discovery to annex California and create a base of operations from which they can destroy Superman once and for all.